The perfect Christmas gift ... is there such a thing? I am the type of person who has to have things planned ahead. So for the past month I have been planning on what to get my boyfriend Luis for Christmas. 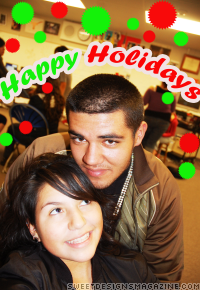 It's going to be our first Christmas with each other so I want it to be special. It is Luis' family tradition to leave for Mexico on the 20th of December and stay until the New Year. So I am not going to be able to be with Luis on Christmas Eve or Christmas Day. I still want to make it special as if we were together. So this year we are going to have an early Christmas. On the 19th of December Luis is going to take me out. We are probably going to eat out somewhere fancy and then go to the beach. Originally I had plans to spend a lot of money on Luis for Christmas. Then I started thinking, and instead of spending a lot of money I decided to do something romantic and special - something that would always be remembered. So I have been working really hard thinking of something special I can do for him. I have started to write Luis a poem. I am going to make him a card with the poem included, expressing my feelings for him. Then I am going to bake him cookies and arrange more goodies in a little basket. I plan to give him his basket of goodies at the beach after I give him the card. You see, a Christmas gift isn't always just spending money on somebody. I'm sure you've heard the phrase "it comes from the heart", and that is true. Even if you think that your present isn't enough though it comes from the heart, it is special in a certain way. You are making a memories, and those last longer than anything money can buy. Well, to find out what happens with my present, look forward to my next article in the January issue.